PHOTOGRAPHY’S FIRST FUNCTION WAS AS A RECORDING MEDIUM, as a way to arrest time in its flight, to freeze select seconds of it. As evidence. As reference points. We were here. This happened. Soon, however, the natural expansion that art demands generated images of the things that happened before our direct experience. Ruins. Monuments. Cathedrals. Finally, the photograph began to speculate forwards. To anticipate, even guess, about what might be about to happen. That is the photography of the potential, the imminent. It’s rather ghostly. Indefinite. And all in the eyes of the creator and the beholder. Is something about to happen? Does this place, this kind of light, truly portend something? Can a picture said to be ripe with the possibility of emerging events? I think they can, but these bits of pre-history are harder to sense than those we capture in the mere recording or retrieval functions of photography. In this case, we are not just witnesses or detectives, but seers. Of course, we may be wrong. Something may not happen as we seem to see it at present. History may not be made here. Perhaps no one will ever say or do anything extraordinary on this spot. The image of the possibility, then, becomes a kind of creative fiction, a pictorial what-if. And that places photos in the same arena as sci-fi, mysticism, poetry. If other arts can paint worlds that might be, why can’t a picture? 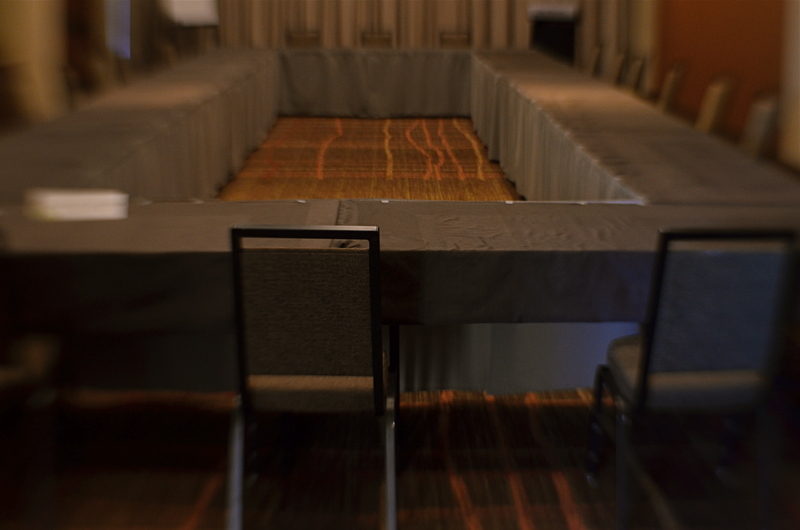 I don’t know why the meeting room shown here, which was being prepared for a conference later in the day, struck me. It might have been the somber color scheme, or the subdued light. It may have been the grand emptiness of it all; a room designed to be packed with people, sitting there, waiting for them to animate it. I just know that it was enough to slow my trek through a resort hotel long enough to try to show that potential. For what? A moment of high corporate drama? The end of someone’s career, the launch pad for a bold new idea? The meeting that might redraw the map of human destiny? Or nothing? Ah, but what actually happens after the photo is taken is mere reality, and never to be matched or compared with the strong sense of eventuality that can linger in an atmosphere before something occurs. These kind of images are not, after all, witnesses to anything, but visions of the possible. And that is the essence of photography, where even a medium invented to record reality can ofttimes transcend it. This entry was posted on February 13, 2016 by Michael Perkins. It was filed under Available Light, Conception, Experimentation and was tagged with atmosphere, Conception, Mood, Space, Speculation. Thanks. Possibilities are what keep us all clicking away.